From Contrarian Outlook: It’s a good time to be a virtual landlord. REIT (real estate investment trust) dividends just got a tax break, their stock prices are kicking off a rally and their yields are still on the generous side. Kicking yourself for missing Ventas’ recent sale? Don’t worry, I’ll share an even better buy – one that pays 9%! – in a moment. 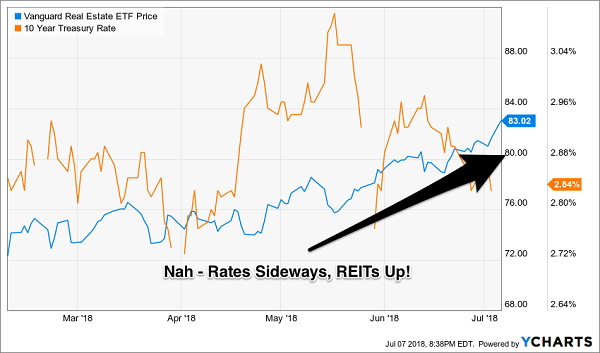 In the short run, the “rates up, REITs down” theory puts on quite the show. When the 10-Year Treasury’s yield rises, REITs usually fall. And when its yield drops, REITs usually rally. This inverse relationship tends to hold up over multiple days, weeks and even months. … Until REIT Prices Rallied! As regular readers know, I’m a bit of a “REIT addict.” I constantly comb the sector for timely deals, looking for big yields and bargains. I like to watch the movers and shakers – the stocks heading up as well as down. Earlier in the year, out of the 257 or so REITs I follow, only five had stocks in uptrends. Five out of 257 moving higher! Today, I count 146 with positive momentum. What changed? 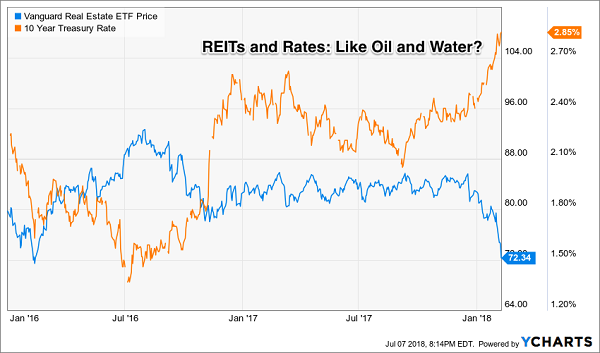 The “first-level” investors – those who buy and sell on headlines and cheesy maxims – began to realize that REITs can (and often do) move higher in the face of rising interest rates. Also Mr. Market began to express doubt in Mr. Jerome Powell’s view of the financial world. While Fed Chair Powell says he needs to hike rates another 0.5% this year, the “long end” of the rate curve – set by the free market – appears to be saying “enough already.” The 10-year Treasury sits exactly where it did five months ago, and that’s been enough to kickoff a party for our favorite one-click landlords. Of the 146 stocks I’m watching, seven in particular stand out as best buys right now. The first pays 9.2% today and its stock has 20%+ upside from here. The firm’s senior leadership team – led by its founder of 35 years – is “all in” on their stock and its near-10% yield. Their collective ownership tops 30%. This is a level of skin-in-the-game rarely seen any more on Wall Street! Which means, when the team decided to raise their payout for the sixth time in the last eight quarters, they were quite confident in their ability to fund $1 per share in dividends. This is particularly interesting to income investors like us because shares trade for less than $11 as I write. Which means we can buy shares to day to bank a 9.6% current yield that has management’s personal guarantee. The next six are no slouches either! All seven REITs in my 8% No Withdrawal Portfolio check one of the two “dividend growth” or “high current yield” boxes for rising rate environments (with most actually checking both). As a group, they pay an impressive 7.6% average yield today. That’s outstanding in a 2% to 3% world. 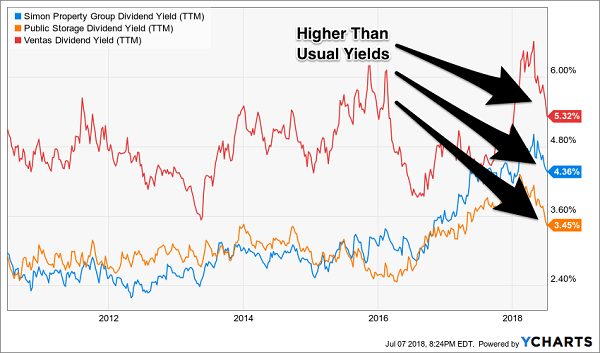 Combine 5% to 10%+ dividend growth with these high-single-digit current yields, and we have a formula for safe 15% to 20%+ annual gains from REITs. With a significant portion of that coming as cash dividends. And thanks to the new tax plan, there’s never been a better time to buy REITs and live off their dividends. But it’s important to choose your REITs wisely. Don’t buy low-yielding static payer. Don’t buy a retail REIT, either (with that entire industry is in a death spiral, future rent checks will be dicey for years to come). Instead, focus on recession-proof firms, such as those that rent hospitals, business lodging and warehouses filled with Amazon packages. Landlords that own properties that will be in high demand no matter what happens to interest rates or the economy from here, in other words. 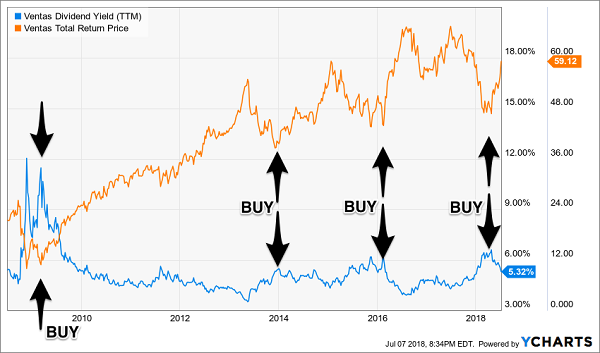 I’d love to share my seven favorite recession-and-rate-proof REITs with you – including specific stock names, tickers and buy prices. Click here and I’ll send my full 8% No Withdrawal Portfolio research you to right now. The Vanguard REIT Index Fund (VNQ) was unchanged in premarket trading Thursday. Year-to-date, VNQ has gained 0.10%, versus a 4.16% rise in the benchmark S&P 500 index during the same period. VNQ currently has an ETF Daily News SMART Grade of C (Neutral), and is ranked #13 of 25 ETFs in the Real Estate ETFs category.